I was out running errands today and I stopped by a little market for garden salad ingredients. It's not the usual place I shop, so I gave myself permission to walk around just to "see what I could see." I found the Erdnuss Chocs (think, peanut M&Ms) and the Choco Crossies - a white chocolate and cornflake crunch bite. Oh yeah, those sound good. And then...in the dairy section...I saw... Philadelphia & Milka cream cheese! What?! Delicious chocolate already mixed into the cream cheesey goodness. Whew. "Was that angels singing?" Chocolate Cream Cheese cupcake cream filling in a Banana Cupcake with Strawberry Vanilla frosting ... that's a Banana Split! The Jeff de Bruges chocolates are similar to Jordan almonds..but with a French chocolatier twist. The flavor is phenominal and the colors are imaginative. My husband found them for me and sent me back to see if there was anything else that caught my eye. Why yes, I'd love that hot pink Praline! My Fiesta Ware brings me joy and color. It is definately inspiring. Not all that I have here in Germany fits in this cabinet, but most is there. The bulk of my collection is in storage in the States and I look forward to combining old colors with new colors. The vibrancy gives me ideas and I like to see what colors work together..there are so many combinations I would never have tried, but futzing around with my dishes gives me confidence to try new combinations. My new manicure today was fabulous...I love the color and shape. I can see oval shapes on a cake.. maybe an ombre effect. Or maybe tear-drops? ﻿﻿﻿﻿﻿﻿Love inspires me... time with my life partner is precious. 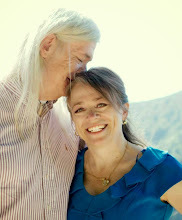 We have 26 years together (consecutive, to each other). And, over the years there were really, really rough patches during which I didn't like him one little bit. For real. You know that time when there is love but not much like? walking by and gave us a slight bow and a dignified, "Bon Appetit." A cupcake inspired by those periods would be either a crumbly mess or maybe a cupcake left on the kitchen counter to get old and stale. Neither are appetizing. Perhaps that is why today is sweet. And it is inspiring to me. Shapes and architecture inspire me. 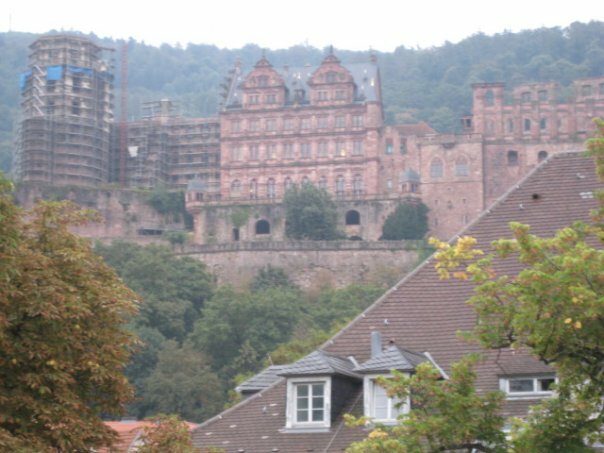 The Heidelberg Castle is outside our living room window and I get to enjoy the view most mornings with my vegetable omelette. I don't tire of it or take it for granted. The granduer is worth the trip. This picture was taken two years ago - the scaffolding has moved to the right. Marzipan inspires me...I found tinted bricks at a lovely grocery in Paris and here in Germany. Prepared fondant was on the shelf of dime-store-esque shop I wandered into in Belgium. And, at the Cake & Bake Accessories Store in Paris.. there was ready-to-roll out frosting. It is unbelieveable that so many different options are available based on culture and flavor preferences (I have yet to see fondant in Germany, but marzipan is easy to find). Moments and feelings and new shoes and Diet Coke and people watching...all inspire me. I totally get a kick out of my family and friends inspiring me. I'm back in the kitchen tomorrow before traveling over the holiday weekend. I'm not sure what I'm baking - but I know I will find joy in the process.